M39029/58-360, Electrical Contact, Size 22, Pin, Pin. The M39029/58-360 contact is compatible with Mil-C-24308; Mil-C-55302/69; Mil-C-38999 Series I, II, III, IV; Mil-C-83733 Connectors and designed in accordance with SAE AS39029 requirements. The M39029/58-360 contacts are suitable for aerospace and defense equipment subjected to high-vibration and temperature extremes. 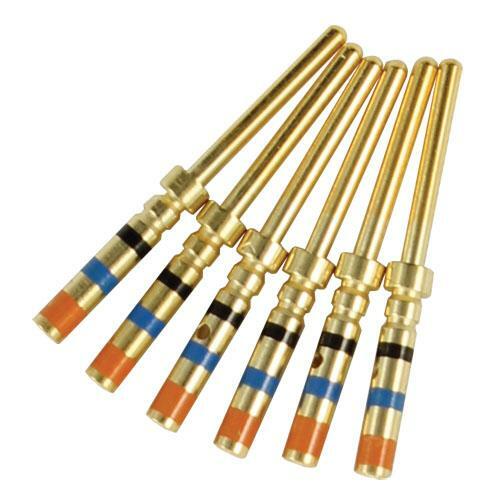 These snap-in, rear-release contacts fit the Mil-C-24308; Mil-C-55302/69; Mil-C-38999 Series I, II, III, IV; Mil-C-83733 connectors. Crimp termination, SAE AS39029 qualified. Shipped unassembled with assembly instruction sheet, expander tool and push-rod tool. The M39029/58-360 contact meets all MIL-C-39029 and MIL-C-29600 standard requirements for use in cable harnessing and repair, military, aerospace, ground defense, MRO, civil aviation, automotive and industrial applications.